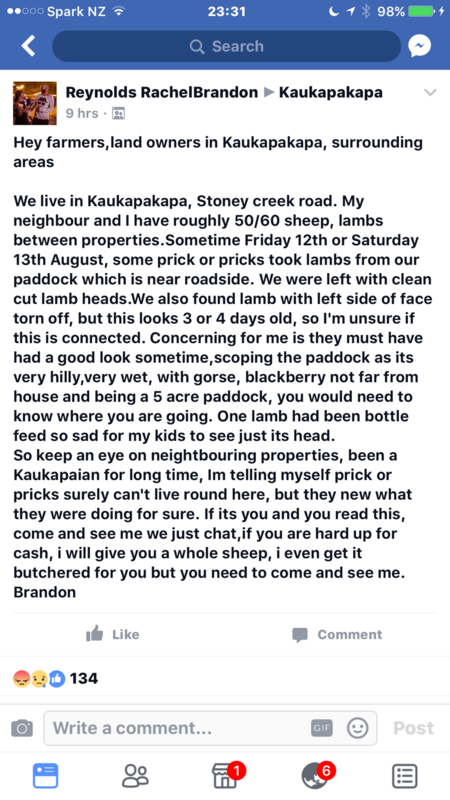 We live in Kaukapakapa, Stoney creek road. My neighbour and I have roughly 50/60 sheep, lambs between properties.Sometime Friday 12th or Saturday 13th August, some prick or pricks took lambs from our paddock which is near roadside. We were left with clean cut lamb heads.We also found lamb with left side of face torn off, but this looks 3 or 4 days old, so I’m unsure if this is connected. Concerning for me is they must have had a good look sometime,scoping the paddock as its very hilly,very wet, with gorse, blackberry not far from house and being a 5 acre paddock, you would need to know where you are going. One lamb had been bottle feed so sad for my kids to see just its head. There have been a few sightings of suspicious activity involving a dark sedan scoping out lambs in a paddock on Martin Access Rd, it’s potentially related. So, please keep your eyes open and alert the police to any suspicious behavior you might see, then drop us a note so we can warn the neighborhood support groups. We have an orphaned lamb and looking for one or two friends for it.